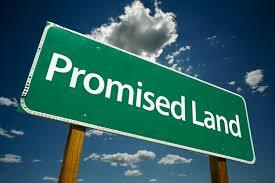 What is in your Promised Land? Mint chip ice cream cake. Time and space to be creative. I’m home from camp. Clean and dirty clothes are still stacked up in their respective laundry baskets. The various accoutrements of our camp-style living are waiting to be packed up or put away. Yet, I’m still thinking about the conversation I had on Shabbat morning with the Avodah-niks and CITs (rising 11th & 12th graders). Parshat Shelach-lecha, Numbers 13:1-15:41, tells the story of the Israelite spies going ahead into Canaan, to see what they can learn about its inhabitants. The scouts come back with differing reports. Ten of the scouts are pessimistic and doubtful, concerned that the giants living in the land will overcome the Israelites. Only Caleb and Joshua are optimistic about the possibilities that lay ahead; it is a land flowing with milk and honey. The parsha is traditionally interpreted to be about a test of faith in God, which Caleb and Joshua pass with flying colors, and the other scouts fail miserably. Yet, I saw a different lesson in the story: a lesson about perception; a lesson about vision. Caleb, Joshua and the 10 other scouts all witnessed the same things during their reconnaissance mission. Yet, they returned to the Israelite community with different visions of the Promised Land. So too, with us, we each have our own visions of what the Promised Land looks like. The Avodah-niks and CITs, their visions were for spaces of safety and love and support. Spaces with yummy foods and community. Together we noted that there may in fact be two different types of Promised Lands. The external Promised Land is where we find mint chip ice cream cakes and good friends, and supportive communities. Our internal Promised Land is one in which we eliminate that which holds us back – stress or anxiety – and embrace that which projects us forward – creativity and love for others. Neither of these Promised Lands is unattainable. Both Promised Lands are within reach. Together we have to do the work to make our visions into realities. I think I have to take 1, 2, 6 & 7. Maybe 7 would be number 1.